Welcome to Chocolate Friday! So glad we made it to the weekend - you deserve some chocolate for gettin' through the week! And let me just say a quick Happy Birthday to my wonderful hubby today (a whole post just about him would embarrass him)! I love you dear! While I was on my trip to MT, I did make it in to my favorite local candy store - AGAIN! You must understand, it's been a favorite since childhood and my Mother even went there to hang out in the 50's! So I absolutely get there every time I visit! I had the Parrot Special - again! Shared it with Dad this time. 3 scoops of creamy homemade vanilla ice cream topped with 3 homemade toppings of hot fudge, caramel, marshmallow and chopped pecans on top. Are you drooling? It's actually quite small, but soooo satisfying! At least this time, I totally controlled the candy purchasing. I sent hubby up to the counter and he got me one chocolate-covered caramel. Yum! That is probably the least amount of candy I've had there in years - LOL! There was something different this time though! New owners! 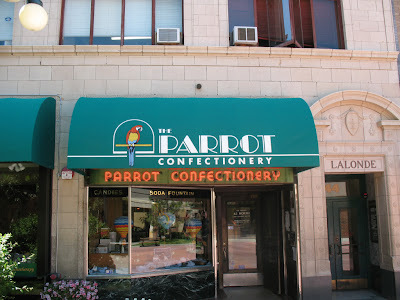 I was a little concerned, but we met one of the owners and he said that they consider themselves the "curators" of The Parrot - they want to keep everything the same and are learning all the candy-making techniques right now from the old owner. Sounds great! So funny - my son spoke up (not yet 10, this kid) and said, "Are you keeping the prices the same too?" The new owner chuckled and said they might have to raise them a little for inflation and complimented him on his head for business. There's my dose of chocolate for you! Now, don't you have some chocolate for me?? Just a little ol' chocolate-themed post, even if it's from the archives? Oh I know you can find something and bring it back and link it up and fry it up in a pan 'cause you're a woman...oh, wait - that was from a commercial, probably one you don't remember from before your time. So don't fry it up, but do link it up! I'm having a problem with Mr. Linky and don't have time right now to set up the new MckLinky, so please leave your links in the comments and I'll add them to the post during the day. And good for your son for asking such an intelligent question. Big keep things the same and noone gets hurt size hugs to you my friend. 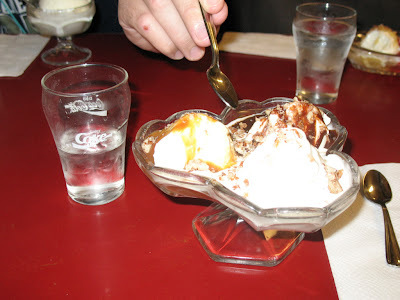 I remember you posting about that little shop before, sweet memories...and yummy goodies (I want that ice cream dish!). I'm gonna post the cake I made for Kimmy's b-day for Chocolate Friday, so Choc/PB lovers unite, LOL. The sundae sounds delicious, with all those homemade ingredients! Hello there! 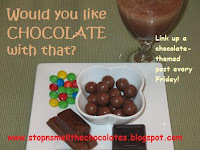 I'm a chocolate-holic, and your blog is sumptuous enough to eat! Because of all these delicious goodies, I chose your blog to receive an award of "One lovely blog." I tried the "contact" link to reach you and send the award, but for some reason, nothing happened. I have a great summer treat to share this week. Hope you enjoy it! And have a great time on vacation. I'm proud of you for only having ONE chocolate. I don't think I could do that!! I love little local shops. I'm wanting to visit one in Roanoke, VA sometime. It's a little chocolate shop where they make all things chocolate; from candy to greeting cards. I'd love to visit and blog about it. Maybe someday soon. Here's a link for today's chocolate post. That sounds like such a great place! Stopping by from Blog Hop. Don't you just love the local chocolate shops? When we were first married my hubby and I discovered a chocolate shop while staying at a bed and breakfast 2 hours away from our home that had the best home-made chocolates. When we went back the following year, the place had moved. We went to great lengths to track them down at their new location and now visit them about once a year, whenever we're in the area. What a treat!